Also known as the "city of light" has an area of ​​134.65 km ² which makes it one of the largest cities in the province with the same name and community of Valencia in Spain. It is one of the most populous municipalities in its territory 814,208 inhabitants live. Valencia has a unique style. Is one of those places you never forget its history, its origins, but to be modernized over the years. That is, if you travel to Valencia you will encounter a scenario where you can meet ancient monuments and remember the whole story, as you can also visit buildings with unique architectural complexity. But beyond that, the city also offers beautiful beaches, ideal for a summer holiday there. Valencia's coasts are washed by the water of the Mediterranean Sea, thanks to this is that in the city you can enjoy these shores. They might say that these are the perfect beaches. The local climate is ideal, more so in the summer. Also are located very close to the city center, so you do not have to travel too far to reach them. The place is full of activities for them to entertain themselves in the sun, both adults and children can practice skate, play volleyball, tennis, golf, cycling, there are playgrounds, events and performances are held open to the public . Bathe in this crystalline water and rest on white sand make these, your best vacation. At night Valencia is pure celebration, thousands of people come to party till dawn. If you want to be one of them anywhere in the city will find a nightclub, pub or bowling where you can have fun with music, drinks and dancing. But if you want to distract yourself with something quieter but you can choose to attend a play or watch a movie in the cinema. If you like gambling and betting also entertaining you can spend the night in a Bingo or Casino. The nightlife in Valencia is sensational, young desperate hope arrives on Thursday, Friday and the weekend. If you're in the city you can not miss this experience. 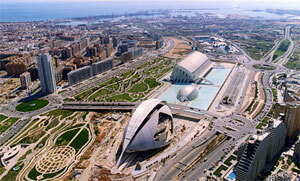 Valencia has one of the best climates in Europe. One of the best times to visit is in summer. This lasts two months, the days are warm, does not come to extreme temperatures but the days are special to enjoy the beach or sightseeing. Instead, winter is very short, only a few weeks are cold. The rains are quite heavy, tend to be more frequent in the fall season. After that, most days of the year are spring weather.